The GraFit installation programs, including the service packs that can be downloaded from this website are now digitally signed and time stamped to ensure maximum security. The digital signature is a class 3 certificate issued by VeriSign Inc. that provides you with the highest level of assurance that the file you have downloaded is genuine. 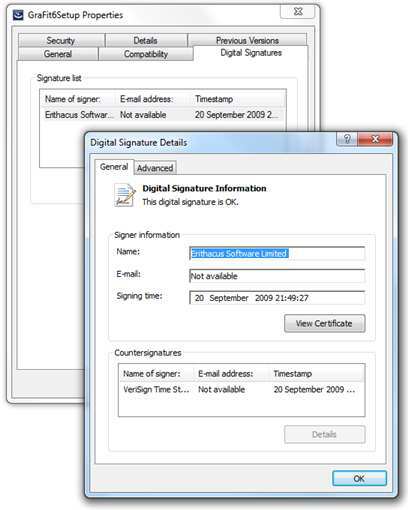 To verify the digital signature, right-click on the downloaded file select Properties and choose the Digital Signatures page.